So, you’re wondering how to make $20 a day online? MAYBE… you think that $20 a day is not that much. Well, sure, it’s not enough to live on. But say if you make $20 every day in a 30 day month…. That’s $600 per month, or $7200 in a single year! It doesn’t sound so bad now does it? The hardest part to making money online, is making anything reasonable at all. It’s building up some income consistency – which tends to be all over the place to start with. I’m not talking about it being hard to make your first dollar – you could do that by taking a single online survey right now. But I’m talking about making reasonable, consistent money – to a point where you can scale it it up. Because once you’re making $20 a day, what’s to stop you making $100 a day and more? Start small and gradually build up your income over time. If you try and jump into thinking you have to make 1000’s of dollars by next week, you’ll end up frustrated and will likely give up on the whole idea. Take baby steps – consistent small actions every day, lead to big results. Starting Out: Have A Target And Scale It Up! I previously did a post talking about how you could make $100 a day online….which was a question I saw posted on Quora. While you could certainly do all of those things to make $20 a day too, I will approach this post a little differently. I’m going to include some additional ways that you could start out too. Because, way before anyone makes $2000+ a month and beyond, they’re going to be making considerably less than that. A dollar a day, $5 a day, $20 dollars a day, $50 dollars a day and so on. Although we’re talking about daily here, that’s not normally how things will happen online. So, your income may very well vary considerably day by day. But the end result will add up to a certain amount each month and that’s what we’re all aiming for, right? Often it will take making just a small amount online, to make us realise that the reality is possible. You’ll certainly be able to use these options to scale and make far more. To start off, think of a target that seems within your grasp. It’s far easier to focus on making $20 a day, than making $100 a day in the beginning. What Are Some Legit Ways To Make $20 A Day Online? Naturally, I have to mention this first, because this is one key way that I make money online. This is a long- term method, but can be an extremely profitable one if you STICK with it! I didn’t make my first $20 in a day affiliate marketing until around the 4 month mark!!! After that and it was a gentle progression from there. I’d like to point out that there are plenty of people who achieve a reasonable income far faster I ever did and can even get to a full-time level in less than a year. If you do want to build an income that can become more passive over time, affiliate marketing is a great way to do that. Don’t get me wrong, you do have to put effort in initially, but once you reach a certain level, it can start to snowball suddenly. You can then continue to make sales, even when you’re not working on it. Even when you go abroad for a while and take a break, that is the beauty of it. All the work you do in the past with affiliate marketing, can pay you a long way into the future. It’s not just one of those things where you do something once and get paid once. It’s a gift that keeps on giving. Start learning for free here! Freelancing? A Great Place To Start! Freelancing is a much more direct way to start making money online and can really boost your confidence. If you’re going down an affiliate marketing route, freelancing can help boost your income on the side while you build up that side of things. In fact, a lot of bloggers end up making freelancing their full time gig! While freelancing is competitive, there is also a huge demand for it and it doesn’t just include writing. Freelancing covers a broad spectrum and if you don’t think you have the skills required right now to get started, many are easily learnt. For example, some people are looking for people to do simple computer based tasks for them. Such as setting up their WordPress website, uploading a new theme, making sure their blog posts are optimised for SEO. There’s people looking for graphic design work, social media management, virtual assistant work… the list goes on and on. The chances are you have some skill that people are after and if you’re not sure, there are courses you can find that can help. Recently, I took Gina Horkeys’, “30 days to Freelance Success,” which I recommend for beginners. Gina went from $0 – $4,000 a month in just six months freelancing. It was hearing Gina’s story on this episode of the side hustle show that made me see just how lucrative freelancing can potentially be. Also, you can pick up a list of Gina’s 200+ Freelance niches here for free. That should give you plenty of ideas. 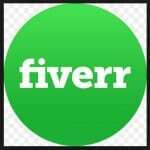 Fiverr Gigs – Starting Small, Building Up. Alternatively, if you don’t want to jump right into freelancing… you may want to check out Fiverr. There is a massive range of gig options available, (including some really weird ones!). While you can only earn a small amount per gig at the beginning, ($5) you do get more options as you advance on the platform and can earn considerably way beyond that. Plus, to reach your $20 initial target, that’s just four gigs per day. The best sort of gigs are definitely ones where you don’t have to trade your time for money. So, lets say you have an ebook, a course, a meal plan, a prerecorded video. Alternatively, you may have a piece of software that will the do a super quick job for you, thereby limiting the amount of time you need to spend on each gig. So, take keyword research – if you had a tool like Jaaxy, (30 free searches) you could get a whole bunch of results in a couple of minutes. Send off your results and the work is done. While competition on Fiverr is growing all the time and getting on there is completely free – even if you set up a weird and wonderful gig as an experiment, what have you got to lose. who will say anything you like as a 60’s rocking Hippy. They definitely have some unusual gigs selling well, so use your imagination. User Testing – Get $10 Per Test! Website testing involves you visiting various websites and providing feedback. Usability sites will record your voice and your computer screen, while you complete simple tasks. User testing Pay $10 for each test that you complete. Each test takes around 20 minutes. So, if you complete two tests per day, that’s your $20 a day right there – in only 40 minutes. I recommend User Testing all the time, because it’s a company I use and have good experience with, I just wish they had an affiliate program :). The down side with User Testing is, it would be rare for you to qualify for two tests a day and you often won’t be sent tests every day. Sometimes I may go a day or so with no tests and then be emailed a whole bunch at once. However, often a company is looking for a specific demographic, so you will not qualify for every test you go for. One way to maximise your potential earnings, would be to sign up to a few different similar sites. For example, you could try Testing time, Userzoom, or Userfeel. I included user testing in my top extra income site list, because I enjoy it so much. Extra Pocket Money Sites – Can Give You A Mini Boost! I’m not suggesting you start wasting your time on survey sites, you really do not want to go down that route to making $20 a day! Way too much time and not enough money. But the one site you shouldn’t overlook, is Swagbucks. This is the only extra income site I still use every day and that’s primarily because I use them for Cashback and for their search engine. For example, every time I order a takeaway – I get points. Every day if I use them in the search engine, I get points. I’m currently saving all my points and won’t be far off my next gift card – I’m going for $100 gift card this time and that is not from doing a single survey. You won’t make $20 a day through this, but if you mix and match different methods, you will boost your income. You actually get a $5 bonus just for signing up here. I like the idea of having multiple income streams, over time these can grow into decent payouts. Last but by no means least, I should mention a side hustle of my own…. Merch By Amazon – Designing Tshirts. So, lastly, I wanted to talk about this unusual opportunity. Merch by Amazon has become my own most recent side hustle and while I haven’t made a single dollar from it as I write this article, it’s super early days for me. Merch update: My first $100 with Merch. *update: Since the above post, my recent Merch efforts disappeared into the void, just not enough time in the day! But don’t let that stop you. Merch is considered by many, to be one of the biggest potential income opportunities to come along for quite some time. Already, people have made many thousands of dollars here and the numbers are growing. Merch by Amazon give you the opportunity to upload t-shirt designs to the Amazon platform and sell them for a profit. Amazon will print the designs, ship them off and handle all the customer service. How much you make, depends on how highly you price your shirts and how many you need to sell. Depending on the price point, you’d need generally need to sell between 4 and 7 shirts to make $20. The best thing is, this is a massive passive income opportunity. You create and upload your designs and you could be receiving payments for them for months or years down the line. You don’t even need to be a designer! Many of the best selling shirts are text based designs. What’s more, you can hire some designers oversees on Upwork, for as little as $3. BUT… there is a small catch here. Amazon Merch is invitation only right now, which means you need to apply to be accepted, (anyone can, you don’t need to be a designer or anything) and then you need to wait. Some people have waited a year to be accepted, while others have been accepted within a couple of months and no one really knows why! There is a tonne of worthwhile and motivational information about Merch By Amazon over at the Merch Informer blog. I will do some more Merch related posts once I start seeing some progress with it. But if you check out the main Facebook group, plenty of people share how much they’re earning right now. So, that concludes my post for today – do you have any other suggestions? 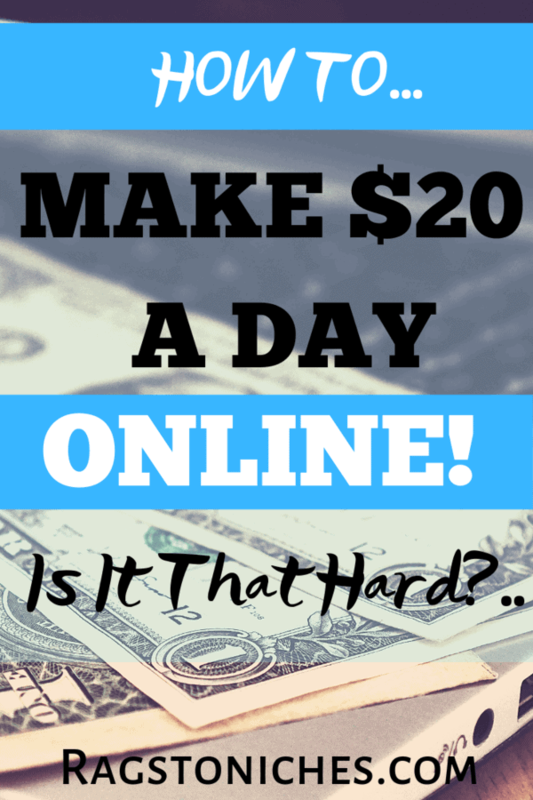 How would you choose to make $20 a day? I personally made my first $20 a day via affiliate marketing my first niche blogs. Another way, is from having Ads on my site, (which I didn’t for over two years!). Most Ad networks are just not worth it, but I just joined Mediavine and they pay way better than something like, Google Adsense. You need 25,000 sessions a month before they will consider you though, but it’s been worth the wait! The great thing is, there are so many ways to make money from a blog or website once you can get traffic. Most of the traffic I get is completely free, all from the search engines. I learnt how to do everything I know now, right here, (there is some free training you can check out!). Let me know in the comments, if you have any questions. Other posts you may like…. 14 ways to make money with a WordPress site. 10 easy ways to make $10 online. prior to reading this article i had no idea about how people make money online. i knew it was possible but that is as far as my knowledge stretched. after reading this article and going around the rest of your site i feel much more knowledgeable so thanks a lot for that. Really pleased I could help you out. Let me know if you need anything else! i really need information how to make a real money i am tired to search and all is fake just playing nothing happening, please advise where i can work online and make some extra income.